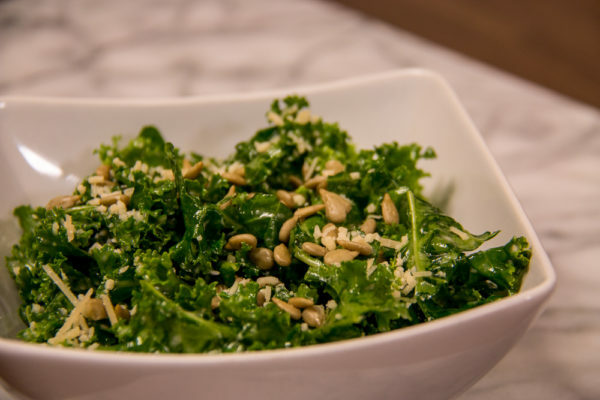 Instead of hiding your kale in a smoothie (a trick we love) try highlighting this superfood with a simple massaged kale salad. Massaging the thick kale leaves breaks down the tough cellulose structure making the leaves silky and tender. Offer a topping bar to let each child customize their salad and add a favorite flavor. Start by washing hands and fresh produce! Strip the kale leaves off the stem and tear into bite-size pieces, place in a large bowl. Add all the remaining ingredients except the parmesan cheese and knead or massage with clean hands for 3-5 minutes. As you massage you will notice the leaves softening and turning a dark green color. The volume should reduce by about half. Serve as is or add one or more of the optional toppings. If you have a student that does not like to get their hands dirty, use food service gloves or make the salad in a zip top bag and massage the bag.